Portrait of Aurel Vlaicu (1882 - 1913), Romanian engineer and inventor, pilot and aeroplane builder. Centred, an Edelweiss flower (Leontopodium alpinum) and a stylised aeroplane propeller, between the flower and the portrait. Up, the Romanian Coat of Arms, the name of the issuing central bank "BANCA NATIONALA A ROMÂNIEI", and an inset with the NBR logo. Down, the banknote denomination in figures and letters "50 LEI CINCIZECI". Above the denomination, the authorised signatures of Governor and Chief Cashier. 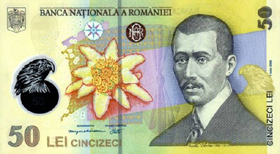 Vertically right, denomination "CINCIZECI LEI", issuing date "1 iulie 2005" and denomination "50". Centre, a mountain eagle head (Aquila chrysaetos), symbolising the courage of Aurel Vlaicu and of his flight. On the left, the design of "Vlaicu II" aeroplane. Behind, the "Gnome" engine sketch. Up: the denomination value "50" vertically and horizontally, the name of the issuing central bank "BANCA NATIONALA A ROMÂNIEI" and the NBR logo. 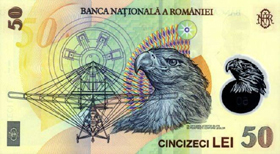 Down, right: the denomination value in figures and letters "CINCIZECI LEI 50"; left, a sign for visually impaired: NBR logo within a rectangle. Beneath the eagle head, the penalty text, vertically: "FALSIFICAREA ACESTOR BILETE SE PEDEPSESTE CONFORM LEGILOR" (FORGERY IS PUNISHED ACCORDING TO THE LAW). Serial number black, vertically, on the left side; serial number, red, increasing characters, horizontally, on the right side.